Apple finally released the fifth-generation tablet iPad Air alongside the iPad Mini 2 with Retian Display on October 22, 2013, just weeks after the sensational iPhone 5S and iPhone 5C launch event. This time the new tablet is slimmer and narrower than its brothers, while remaining the existing 9.7-inch screen size. With that in mind, it is tempting to get this glamorous gadget for watching DVD movies and videos on its HD retina display. However, Apple pad still cannot play DVD movies directly because of DVD drive absent. If you want to play beloved DVD movies on iPad Air, the only way out is to rip DVD to iPad supported format in advance. The task of converting DVD to iPad Air would be as easy as blowing off dust if you get a practical and professional DVD ripper software. Here, MacX DVD Ripper Pro is recommended to you without preamble. With intuitive and easy-to-navigate interface, this program can easily rip DVD to MP4, M4V or H.264 that is friendly with iPad Air at 36x faster speed. The shining point lies in its unique ability to decode any copy-protected DVDs, no matter the new Disney DVD Copy Protection or the general CSS encrypted DVDs, Sony ARccOS protected DVDs and all region 1-6 commercial new movies on DVD. Therefore, you can import any DVD to iPad Air for watching at will. Best DVD to iPad ripper for Mac (El Capitan/Yosemite) to convert and rip DVD (copy-protected) to MP4, MOV, AVI etc 100% original quality for iPad Air 2, iPad Pro, iPad mini 4 etc with 36x faster speed! Besides, this DVD ripper also boasts the robust function of converting DVD to popular video formats, be it AVI, MOV, MP4, FLV, MKV, MP3, etc, as well as ripping DVD movies to iPhone 6/6 Plus, 7/7 Plus, 6s/6s plus/5S, iPod, Galaxy S4, HTC One, Google Nexus 7, Surface, PSP and more, thoroughly catering to diverse DVD ripping and converting demands. This DVD to iPad ripper has Mac and Windows versions. Here we take Mac version as example. For PC users who want to convert DVD on Windows, please download the MacX DVD Ripper for Windows and then follow the guide (the operations for two versions are basically the same). Download and install this DVD to iPad ripper on Mac. After running the DVD ripper, insert the DVD disc to your DVD-ROM, and then the software will detect it automatically. Click the "load DVD disc" button to load your DVD. You can also add DVD folder or ISO file. After completely loading the DVD movie, an output profile category menu will pop out automatically. You will find there are many output profiles provided. Click "Mac general video" to choose MP4, MOV or H.264 recognized by iPad Air as output format, or you can navigate to "Apple device" > "iPad video" to select the specific format based on your need. Step 4: Start DVD Conversion. Finally, hit the bottom right "RUN" button to start to rip DVD to iPad Air on Mac. You can view the conversion process or cancel it at any time. After the conversion is over, you can transfer DVD to iPad via iTunes or MacX MediaTrans for playback anytime and anywhere. Tips: The excellent video editing feature is icing on the cake for this DVD to iPad Air ripper. By hitting the "Edit" button the main interface, you are enabled to remove unwanted part and black bar, crop video size to better suit your device, merge several video into a single one, add external *srt subtitle to video, etc. If you have ever tried to play DVD movies on iPad, then you may know how to rip DVD to iPad Mini 2, right? But if you never had the similar experience, this article will show you the detailed steps to rip DVD movies to iPad Mini 2 on Mac. 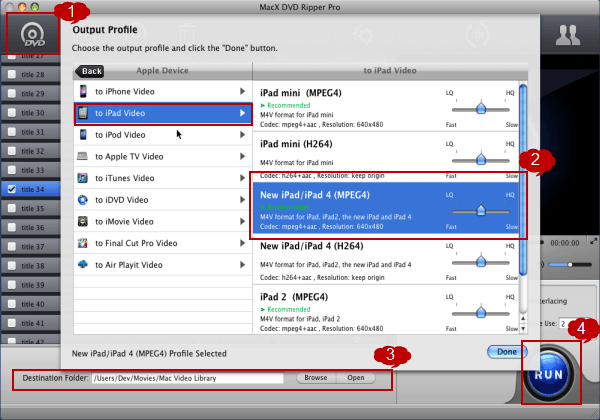 Wondering how to play DVD on iPad? This guide shows you the easiest way to convert DVD to iPad supported video format and transferred the converted DVD video from computer to iPad Mini 4/Air 2/Pro for playback on the move. DVD to iPad Mini 4 guide: Use the best iPad Mini 4 DVD ripper to easily and fast rip & convert DVD to iPad Mini 4/3/2 compatible formats (MP4, MOV, MP3) as well as remove various copy protections like DVD CSS, region code, Disney, etc.